It’s Super Bowl Sunday this weekend, or if you are team Who Dat, it is Anti-Super Bowl Sunday, Black and Gold Yellow Flag Sunday, or Boycott Bowl Sunday. There are numerous parties, celebrations, and second lines scheduled for Sunday in the Big Easy. New Orleanians know how to have a good time and I’m sure many will turn their heartache from not being in the Super Bowl into hangover headaches. We, along with many Saints fans, will be watching a Super Bowl this year…the one from 2010 when the Saints won..which I think they could have done this, year, too! For me, Super Bowl watching is equally about the snacking so I will be making these Sweet-n-Smoky Rib Bites. Benefit: One hand bites means a free beer hand. This recipe came about a few years ago when we were at our cabin in North Carolina for the Super Bowl. Our cabin is somewhat remote, so you have to plan ahead for meals. I had planned the perfect Super Bowl menu, with my second string lineup consisting of smoked rib bites. What I didn’t plan on was the blizzard that arrived. My hubby, being so sweet, said he would attempt to get the smoker going. He probably would have, but as a cook I worried about the temperature being maintained and as a wife I worried about the icy steps he would have to navigate to get the job done. Needless to say, I had to start thinking of an indoor plan B. Plan B was this successful outcome. 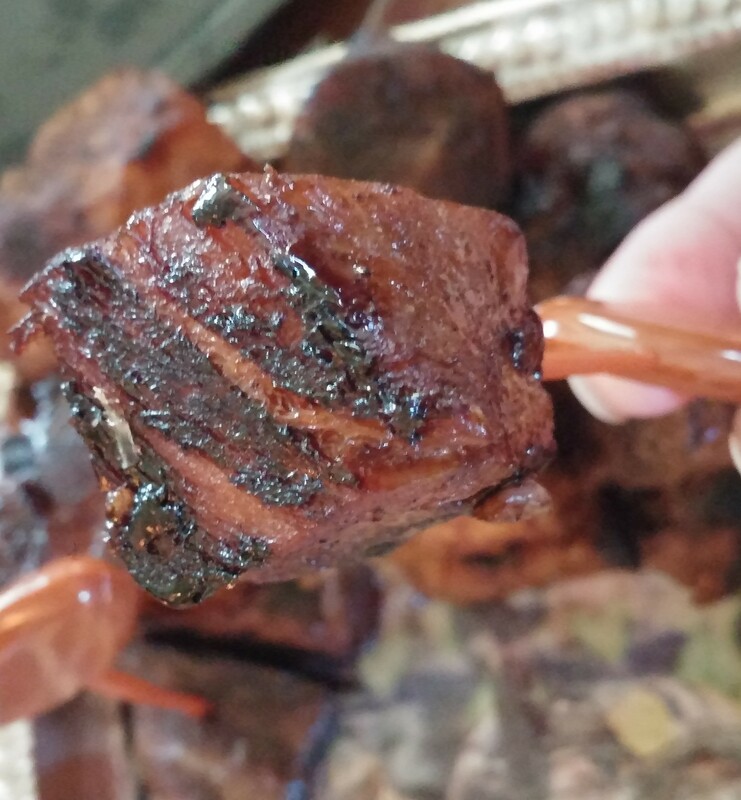 This winter’s frigid cold and polar vortex, reminded me of these indoor sweet-n-smoky rib bites. Sweet & Smoky Rib Bites: First, plan ahead. These rib bites take time, but the investment pays off. 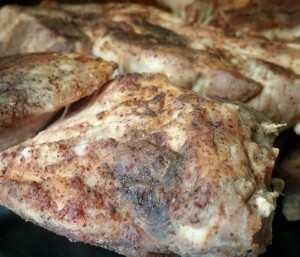 I use country-style boneless pork ribs, not only for the inexpensive price, but for how many I can get for my money-that comes in handy if having a Super Bowl crowd or a hungry family!! You can substitute beef ribs. You can also use your favorite dry rub or barbecue sauce. If you just can’t wait and want to devour the fall apart hot ribs from the oven, be my guest. Enjoy them dry or slathered with sauce for wet. A cast iron skillet is the key to the sweet-n-smoky success. The heat of the iron skillet will help render out the fat in the ribs and help the sugar (either in glaze or barbecue sauce) caramelize making the rib bites have crispy bits, my favorite part of anything grilled. It is this part of the recipe that also makes it my go-to for reheating and eating leftover ribs. When you are done. I dare anyone to tell you they do not look and taste like they are hot off the grill. Mix all dry rub ingredients together. Dry ribs. Thoroughly rub ribs with dry rub. Cover and refrigerate 2 hours or overnight. Pour reserved liquid and 1/2 cup boiling water into bottom of broiling pan with foil packet. Put rack on broiler pan and place ribs horizontally over openings. Cover pan with foil making a tight seal. Bake 3-4 hours. Remove from oven and set aside. DO NOT open foil. Let sit for 30 minutes. Remove foil and let cool before refrigerating for 2 hours or overnight. Cut cold ribs into cubes. Bring balsamic vinegar, maple syrup, and brown sugar to a boil in a small saucepan. Reduce heat. Simmer 3 minutes until reduced and thickened. Pour over rib cubes and toss to coat. Heat a cast iron skillet over medium heat. Drop cubes one by one into skillet. Do not overcrowd the pan. Cook 2 minutes per side. Drizzle extra sauce over rib bites or serve with warm barbecue sauce. Put Your TO COOK IS TO CREATE Thinking Cap On: What other ingredients could you use as a sauce or glaze? Remember a little goes along way in this method. See what you have on hand, even heated and melted marmalade or jelly can be a tasty treat with a little Creole or Dijon mustard added for even more flavor. What other leftover sauce do you have in the fridge? Any sweet and sour sauce leftover from Chinese takeout? What else could benefit from the oven smoke flavor? I love to smoke root vegetables, like carrots, too. The indoor oven style is easier, no lost veggies at bottom of smoker or grill. Don’t have any wood chips? Use 2 Tablespoons liquid smoke to 1 cup boiling water. Need another bite? Try Buffalo Chicken Chip and Dip Bites. FOOD FUN: It is reported that SUPER BOWL Sunday is the second biggest food event in the year after THANKSGIVING! A whopping 33 million pounds of snacks are consumed!! That’s a lot of snacking! That’s expensive snacking! Chances are your friends are snacking, too! Have a “bring your favorite Super Bowl snack and drink” party. Line the players up as they arrive, starters like chips and dip/wings/rib bites, halftime show-chili, sandwiches, and finishers-cookies, brownies, popcorn. The average Super Bowl party guest list is 12 players, but even six will save you some big bucks.